Murderer of 10 is "heroic prisoner"
our people needs men like you"
"Heroic prisoner Thaer Hammad, we miss you. Allah willing you will soon be among us, our people needs men like you." 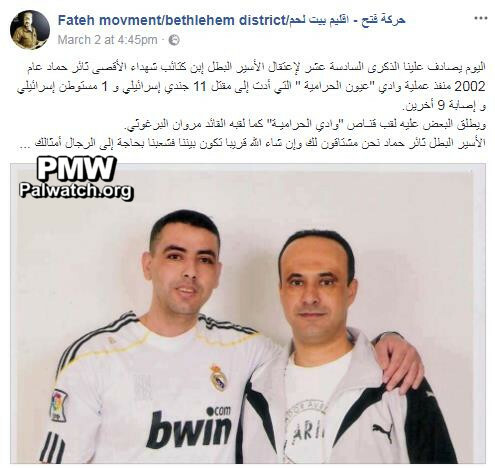 Palestinian Media Watch exposed a video by Fatah, which visually presented murderer Hammad as a successful agent on a military mission. The video glorified the murder of the 10 Israelis as "one of the most famous operations." Thaer Hammad is serving 11 life sentences for murdering 3 Israeli civilians and 7 soldiers by shooting them with a sniper rifle from a hilltop in Wadi Al-Haramiya between Ramallah and Nablus on March 3, 2002. "Hammad demanded to resume and revive the spirit of the revolutionary movement, from which the Fatah Movement arose, and the idea of resistance, given that it is the ideal way to protect our cause and our existence in the shadow of the great challenges and dangers that surround us." 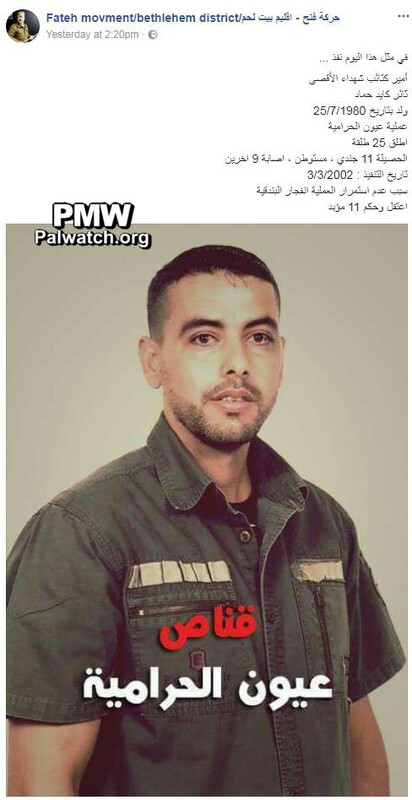 Posted text: "On this date, prince of the Al-Aqsa Martyrs' Brigades (i.e., Fatah's military wing) Thaer Kayed Hammad (i.e., terrorist, murdered 10) - who was born on July 25, 1980 - carried out the Wadi Al-Haramiya operation (i.e., terror attack). He fired 25 bullets. The result: 11 soldiers and settlers [were killed], and nine others were wounded (sic., 7 soldiers and 3 civilians were murdered, and 6 were wounded). The date it was carried out: March 3, 2002. The operation did not continue because the rifle exploded. He was arrested and sentenced to 11 life sentences." Text on image: "The sniper from Wadi Al-Haramiya"
Posted text: "Today is the 16th anniversary of the arrest of the heroic prisoner, Al-Aqsa Martyrs' Brigades (i.e., Fatah's military wing) member Thaer Hammad (i.e., terrorist, murdered 10), in 2002 (sic., March 3, 2018, the day after the Facebook post, was the 16th anniversary of Hammad's attack in 2002; his arrest was in October 2004). He carried out the Wadi Al-Haramiya operation (i.e., terror attack), in which 11 Israeli soldiers and 1 Israeli settler were killed, and nine others were wounded (sic., 3 civilians and 7 soldiers were murdered, and 6 were wounded). There are those who call him 'the Wadi Al-Haramiya sniper,' as he was called by leader Marwan Barghouti (i.e., terrorist who orchestrated three shooting attacks in which 5 were murdered). Heroic prisoner Thaer Hammad, we miss you. Allah willing you will soon be among us, our people needs men like you." Headline: "In a letter he sent from his cell in Nafha [Prison] - Prisoner Thaer Hammad: Bringing back the idea of resistance is the ideal way to protect our existence"
Hammad added: 'The prisoners' movement is still dealing with a brutal attack that is being led by the Israeli political echelon and its security, military, and legal systems. The sole response can only be to bring back the resistance as the one and only way to release the prisoners.'" Thaer Hammad - serving 11 life sentences for murdering 10 Israelis, 3 civilians and 7 soldiers, by shooting them with a sniper rifle from a hilltop in Wadi Al-Haramiya in the West Bank on March 3, 2002.